As an expert Vermont Wedding Photographer, I have had the wonderful opportunity and extreme honor of helping couples to capture all the precious moments of their special day. Wedding photography is a time-honored tradition and while it has evolved immensely over the years, it has retained the fundamentally important role of preserving wedding day memories. The love the couple shares takes center stage and will, undoubtedly, outshine all other aspects of the day. There is no denying, however, that the chosen location for their nuptials goes a long way in determining how successful the day’s proceedings will be. Also, the location plays a big role in the look and feel of the images captured by the wedding photographer’s lenses. The state of Vermont holds many picturesque locations which Vermonters (and many from outside of the state) have gladly embraced as ideal wedding venues. From historic covered bridges to majestic maples, rolling meadows and verdant forests, it seems there is a location here to match every couple’s idea of the perfect wedding setting. As a Vermont Wedding Photographer, I am able to experience a myriad of beautiful venues within the state. Each one reflects its own unique atmosphere, history and warmth while highlighting Vermonters’ welcoming nature and the diverse beauty of the Vermont landscape. It is all a part of what makes Vermont such an ideal (and unforgettable) wedding destination. The Barn at Boyden Farm – Here is a “hidden gem” that sparkles with rustic delights, adding a timeless touch of magic to every special occasion. The intriguing history of The Barn at Boyden Farm (in operation since 1914) infuses every hosted event. 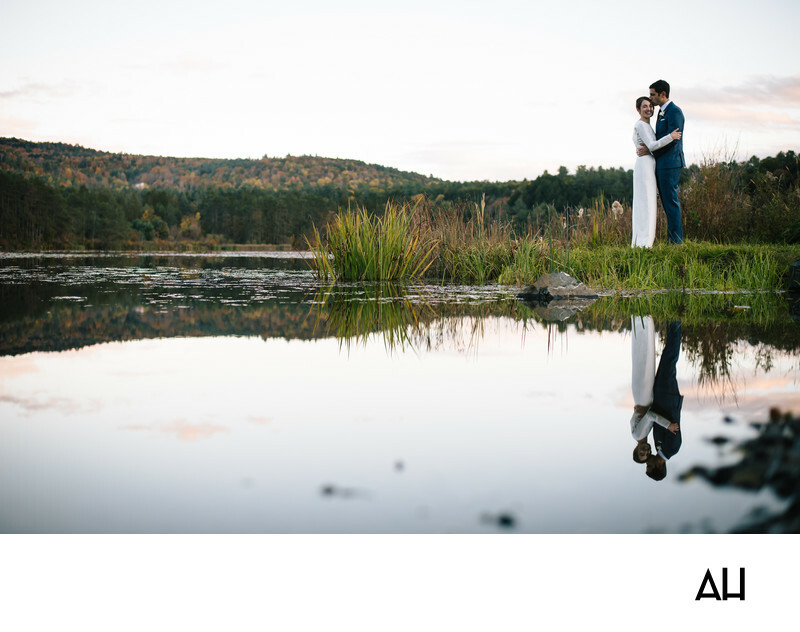 Riverside Farm & Amee Farm Lodge – With promises of “Vermont wedding memories that will last a lifetime,” the Riverside Farm & Amee Farm Lodge offers a lush 300-acre country setting as the picture-perfect backdrop to any nuptials. Sugarbush Resort – The fact that there are so many idyllic venues here means there is one that’s just right for whatever theme a particular wedding takes. The scenes may change with the seasons but Sugarbush Resort’s appeal never wanes. The Inn at Round Barn Farm – This year-round Bed and Breakfast has been chosen time and time again by couples looking to create wedding day memories they’ll cherish together forever. The “classic” Inn at Round Barn Farm is home to one of Vermont’s few remaining round barns. Middlebury Inn – Almost two centuries of history are soaked into the walls and grounds of the beautiful Middlebury Inn – a full service hotel. As a wedding venue, it’s rustic elegance adds the kind of charm that pleases guests of all ages and backgrounds. Weddings at the lovely Quechee Inn at Marshland Farm benefit from an ambiance filled with history and with marvelous views of nature in every direction. The property’s magnificent Georgian style house was built in 1793 and today has the honor of being included in the National Register of Historic Places. The couple in this photo opted for a fall wedding – ideal when paired with Vermont’s lush scenery. Being a Vermont Wedding Photographer, I knew the best pictures would come from witnessing the couple in the natural beauty of the area. With this in mind, I had the new Mr. and Mrs. walk the grounds of the farm with me after their ceremony. The photographs that resulted from that walk captured the immense love which underpins their relationship and makes it so magical. The vibrant colors of the season became even bolder when contrasted with the elegant white and smart navy attire of the bride and groom. It almost seemed that the change in the leaves from green to vivid red hues was representative of the couple’s journey into the brighter, richer love of their marriage. It was a progression as natural as the autumnal scenes against which they made their vows. Having been a Vermont Wedding Photographer for some time now, I am fully aware of the value of wedding photos in helping couples create lasting memories of the emotions they feel on their wedding day. In the moment captured by this image, the newlyweds hold each other close on the edge of the lake at the Marshland Farm. The bride looks towards the camera with a huge smile on her face, while the groom gently kisses her on the forehead. It is a simple pose but one which speaks volumes of the tenderness, contentment and commitment that come flow from pure love. In composing this particular shot, I wanted to frame the couple against the incredible scenery of Vermont. The endearing image of the couple becomes a natural part of the scene and all eyes are drawn to them, regardless of the fact that they are placed off-center. The effect is achieved, in part, by the symmetry created by their reflection in the lake. No doubt, without the reflection and without that symmetry, it would still be an eye-catching photo. But, by allowing the sparkling lake to fill the lower half of the picture, I could take advantage of its surface “doubling” the beauty of the surrounding woodlands and hills. The reflective surface of the lake also creates a line of sight which helps to lead the eyes of the viewer right to the most important part of the picture – the newlywed couple and their proud, natural display of affection. By allowing the reflection and symmetry to become elements of the photo, there is an added loveliness to it. The combined effect of the fall foliage, the lake and the couple so obviously in love thus surpasses being simply eye-catching – it becomes breathtaking!